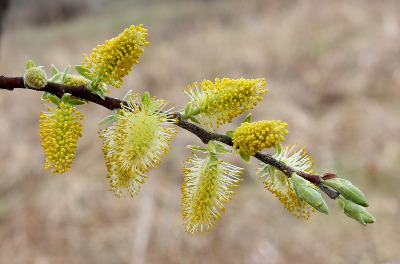 A common, often tall shrub (to 10 m), especially in wet places: swamps, thickets, stream banks, shores, borders of wetlands, ditches. This is one of our most common species and also most variable species, and evidently hybridizes with several others. The narrow pale scales of the aments and long stalks (up to 6 mm at maturity) are helpful characters in identification, in conjunction with the complete absence of any copper-colored hairs (though some may be a little brownish). The filaments are often pilose at the base, as in a number of other species. MICHIGAN FLORA ONLINE. A. A. Reznicek, E. G. Voss, & B. S. Walters. February 2011. University of Michigan. Web. 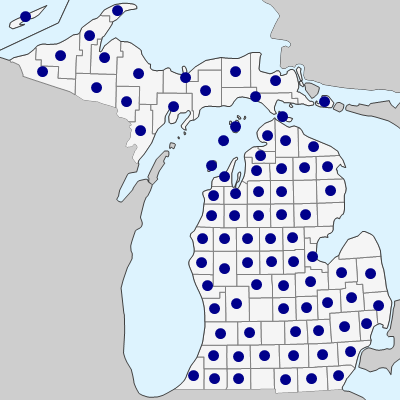 April 20, 2019. https://michiganflora.net/species.aspx?id=2621.